WOW WOW WOW!!! 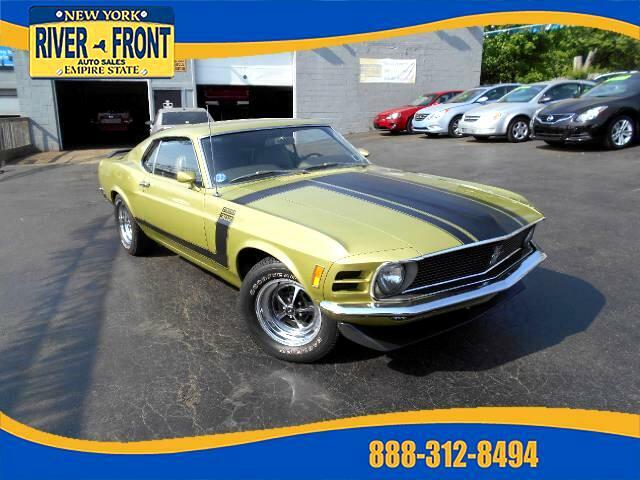 ADD THIS 1970 FORD MUSTANG MUSCLE CAR TO YOUR COLLECTION TODAY!!!! OR COME ON DOWN TO TAKE THIS BABY HOME!! ORRRRRRRR COME ON DOWN TO CHECK IT OUT!!! SOME OF THE MANY FEATURES INCLUDE, mustang 302 boss 2 door, sports roof 8 cylinder, 302 CID 4v boss 8 cyl engine, vinyl hi-back bucket seats, four speed transmission, power front disc breaks, color-keyed racing mirrors, space saver spare, quick ratio steering, competition suspension, functional front spoiler, color-keyed carpeting, instrument gages, belted tires, lime metallic exterior color, traction-lok differential, power steering, AM radio, and magnum 500 chrome wheels just to name a few!!!! We have the best used cars in Buffalo, NY with 100% GUARANTEED FINANCING!! THIS IS AN INTERNET SPECIAL CASH PRICE!!!! Cannot be combined with any other offer or discounts You must bring this ad in with you to get our special internet cash price. Call us toll free 1-888-312-8494 for more information and photos on this or any of our other vehicles Ask about are 5 year 100,000 MORE mile warranty!! THE DEALER THAT GIVES YOU MORE!! We do a safety check. NYS Inspection & Carfax reports are all included. So come down or call NOW! TOLL FREE 1-888-312-8494 River Front Auto Sales, THE DEALER THAT GIVES YOU MORE! LIFETIME NEW YORK STATE INSPECTIONS!! Call NOW!! Toll Free at 1-888-312-8494 for more details and information!! All prices of vehicles are subject to a reconditioning charge of up to $2000. We will not be held liable for any misprints, options, prices or mistakes placed on the ad.